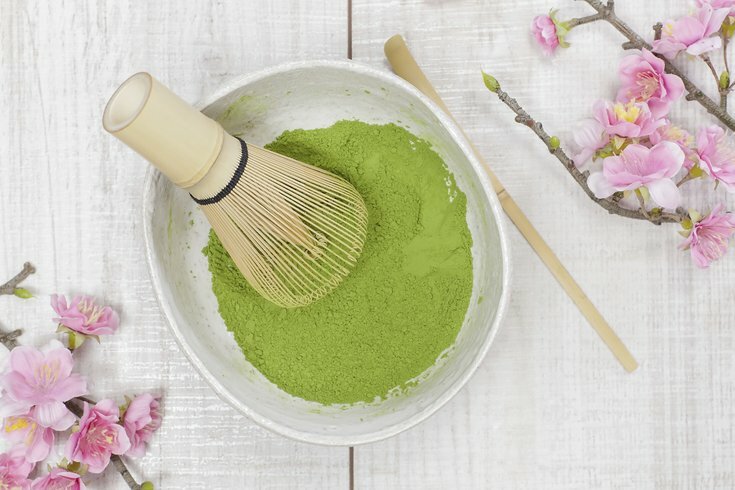 The powdered green tea at the heart of the traditional Japanese tea ceremony has a unique flavor, a vibrant green hue and health benefits to boot. With the recent rise of tea culture in our coffee-obsessed country, matcha has emerged as a food media darling. The powdered green tea at the heart of the traditional Japanese tea ceremony has a unique flavor, a vibrant green hue and health benefits to boot. We asked local tea expert and consultant Alexis Siemons, founder of the blog Teaspoons & Petals, to explain why we should all be drinking (and cooking with) matcha. She also shared two recipes that are perfect for spring. Why are we hearing so much about matcha lately? I think that specialty tea is growing in America because of a combination of the unique cultural experience — the idea of the Japanese tea ceremony — coupled with the health benefits. With matcha, it’s also the ease of use. You simply whisk it or shake it into a liquid like water or milk or a smoothie, or sprinkle it on baked goods, or incorporate it into a recipe. And it’s tasty. Also, it has a beautiful color — that’s a huge factor. It depends on the grade, but the words you might hear are rich, bright, full-bodied, umami. There can be a subtle sweetness to it, or a pleasing bitter astringency — almost like a dark chocolate or a grassiness. For the most part, it’s a bold flavor experience with a creamy mouthfeel. Matcha has a ton of antioxidants, because unlike with other tea, you’re actually ingesting the entire leaf, as opposed to just steeping the tea leaf and only getting the water. Matcha tea leaves are shaded from the sun for two to four weeks, which increases the chlorophyll and L-theanine. And what’s great about L-theanine is it promotes a calm alertness. You won’t have the crash and the jitteriness that you might feel after an espresso, but you’ll have a steady burst of energy. What should one look for when buying matcha? You’ll see a range of matcha prices, anywhere from $5 to $100 for 40 grams. If you know that you’re only going to be putting it into lattes or smoothies or cookies, opt for culinary grade. It’s less expensive, and it’s also blended so that the flavor stands up to other ingredients. When you make a traditional bowl of whisked matcha tea, use a better “ceremonial” grade. Start in the $15 to $20 range so that you can experience what high-quality matcha tastes like. What’s the best way to store matcha? As soon as you open the tin and expose it to oxygen, you should use it within two weeks. Because it’s so delicate, the flavor and the color are going to disappear after a while. As pretty as it is, don’t store matcha in glass or expose it to light, air, heat or moisture. Keep it in an airtight container at room temperature or in your refrigerator. How do you make matcha tea? Making matcha tea is a meditative luxury that you can do within minutes. Use a traditional matcha bowl [chawan] or a large mug or a small cereal bowl. One teaspoon of matcha per three ounces of water is recommended, but it’s up to your personal preference — whether you prefer it thick or thin. The temperature of the water [ideally 176 to 180 degrees] is important; you don’t want to use boiling water because it would burn the matcha and make it taste bitter. But here’s an easy technique: Bring the water to a boil, pour it into a teacup and then pour it again into the bowl that you’re making it in, so that the temperature goes down a little. If you’re using milk, just bring it to a simmer. Rikumo 428 N 13th St. Premium Steap 111 S 18th St.
Melange Tea & Spice 1042 Pine St.
House of Tea 720 S 4th St.
Sift the matcha to help break up the granules. If you don’t have a sifter, add the matcha to the bowl and whisk it while dry. Then add the hot water and whisk the tea in an “M” or “W” pattern until frothy [about 20 seconds]. If you’re new to matcha and you don’t have a traditional bamboo whisk [called a chasen, about $15 at most tea shops], you can make it in a blender or use a milk frother. A small metal whisk will do a decent job, but the bamboo whisk develops the proper foam and helps blend the matcha into the water. You should always drink matcha tea right away because the powder doesn’t dissolve, it’s just suspended in the liquid and it will separate. You don’t have to heat matcha, you can just whisk or shake it into cold water. I recommend putting it into something airtight, like a mason jar or water bottle, because if you don’t shake it often, the matcha will settle at the bottom. What’s the best way to cook with it? Start by just sprinkling it on things to see if you like it — maybe on goat cheese on a cracker. You can mix it in the cheese directly and use it as a spread. Do it right before you’re going to serve it, because the color will fade. I like sprinkling it on pancakes and waffles, too. It adds a wash of color and flavor. I also make a matcha salad dressing, which is really easy. Use a neutral oil, some citrus juice, a little sea salt and a dab of honey. Cookies are probably the most popular recipe — replace some of the flour with matcha so that they’re not too dry. You can stir it into your Greek yogurt or even into vanilla ice cream — that’s what I do when I’m craving green tea ice cream and I don’t want to go to the store.